Pinch of golden chartreuse Angel Hair about 6” to 7” on top of the wing* These constructions give the wing and belly a very nice tapered look. Collars: White arctic fox or white raccoon hair. Tie the first collar in just in front of the weight. Tie it in with the butts over the weights and the tips sticking out past the hook eye. Make sure the collar is spread evenly around the hook shank. *You can optionally tie in the Angel Hair at this point instead of along the wing. The materials appear to flare in the water a more if tied here but it is easier to tie in along the wing. Pull the tips back and tie off. Build a shoulder with the thread about ¼ inch long. Attach the 8 mm plastic doll eyes with Marine Goop. After the glue holding the eyes cures tie a small bunch of arctic fox or raccoon hair (raccoon is hard to get but is much more durable than arctic fox) on top of the hook with the tips extending out past the hook eye. Tie another bunch on the bottom of the hook. Pull the tips back and tie down. Head: White Danville flat waxed nylon – Unwind the twist of the thread so it is flattened and wind on a tapered head. This pattern came about after inspecting the buckets of several bait fishermen in the Long Beach area. The live smelt they were using were only 7 or 8 inches long but they were a lot fatter than I thought. The topsmelt that I foul hooked were also very rotund. Many of them were over an inch in diameter. Doug’s Smelt moves nicely in the water but was about a third of the thickness of the smelt and grunion swimming around in the surf. 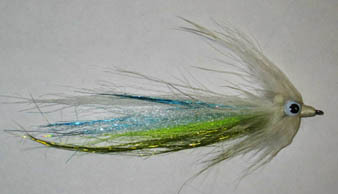 The Fishhair is opaque and copies the white belly of most baitfish. The Ultra Hair or Super Hair is the stiffest of the materials used and gives the fly body. The other materials flare out around this center layer and gives the impression that the fly is much fatter than it really is. I pondered over the name for this fly and settled on the Witch because it is very ugly when dry and the collar looks like the messy hair sticking out from under the hats of cartoon witches. It changes to one of the prettiest flies I have tied when in the water.